ROS-LEHTINEN, Ileana, a Representative from Florida; born Ileana Ros in Havana, Cuba, July 15, 1952; A.A., Miami-Dade Community College, Miami, Fla., 1972; B.A., Florida International University, Miami, Fla., 1975; M.S., Florida International University, Miami, Fla., 1987; Ed.D., University of Miami, Coral Gables, Fla., 2004; founder, Eastern Academy; member of the Florida state house of representatives, 1982-1986; member of the Florida state senate, 1986-1989; elected as a Republican to the One Hundred First Congress, by special election, to fill the vacancy caused by the death of United States Representative Claude D. Pepper, and reelected to the fourteen succeeding Congresses (August 29, 1989-January 3, 2019); chair, Committee on Foreign Affairs (One Hundred Twelfth Congress); was not a candidate for reelection to the One Hundred Sixteenth Congress in 2018. Videocassette: 1989, 2 commercials on 1 videocassette. The commercials were used during the campaign of Ileana Ros-Lehtinen for the 1989 U.S. congressional special election in Florida, Republican Party. Fernández, Mayra. 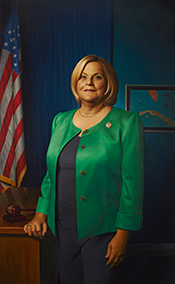 Ileana Ros-Lehtinen, Lawmaker (Beginning Biographies). Cleveland: Modern Curriculum Press, 1994. "Ileana Ros-Lehtinen" in Hispanic Americans in Congress, 1822-2012. Prepared under the direction of the Committee on House Administration by the Office of the Historian and the Office of the Clerk, U.S. House of Representatives. Washington: Government Printing Office, 2013. "Ileana Ros-Lehtinen" in Women in Congress, 1917-2006. Prepared under the direction of the Committee on House Administration by the Office of History & Preservation, U.S. House of Representatives. Washington: Government Printing Office, 2006. Ros-Lehtinen, Ileana. Current Human Rights Situation in Africa. Upland, Pa.: Diane Pub Company, 1996. ___. "Opinions of Members of the United States House of Representatives Regarding National Tests for 9th through 12 Grade Students." Ed. D. Diss., University of Miami, 2004. The Honorable Ileana Ros-Lehtinen recalls how she learned she made history as the first Hispanic woman elected to Congress. The Honorable Ileana Ros-Lehtinen explains how Republicans select Members to chair House committees.